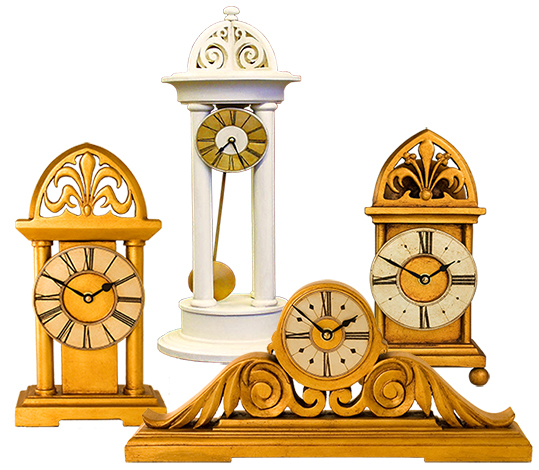 Welcome to my extensive collection of decorative mantel clocks with styles ranging from my Gothic Mantle Clocks through to my Art Deco Mantle Clock and my Contemporary Mantle Clock Collections. To help you find the right decorative clock for you, I've arranged then according to their style with the decorative mantle clocks firsts and then the contemporary mantle clocks. Click on the mantel clocks you are interested in below to access the individual clocks within the collection. The beauty of buying direct from a maker of hand made decorative mantle clocks is that you can get exactly what you want and at an affordable price. 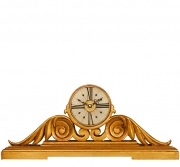 The right style for your decorative mantel clock. With over 20 years designing & making decorative mantle clocks I have build up an eclectic range of clock styles & designs covering the major decorative movements including ranges of Gothic mantel clocks, Palladian Mantle Clocks, Classical Mantle Clocks, Regency Mantle Clocks, Art Deco Clocks. I'm always interested in adding new decorative mantle clock designs to my collection so if you are after a specific style or design of mantel clock then get in touch as it might be one to add to my collection. The right finish for your decorative mantle clock.